David Estes read 87 books of his goal of 75! David Estes read 104 books of his goal of 100! David Estes read 82 books of his goal of 50! To ask David Estes questions, please sign up. Is it important to read the entire "Dwellers" series prior to beginning the "Country Saga" or can they be read simultaneously? However, BEFORE reading the 7th and final book (The Earth Dwellers) in the combined series, you'll want to have read the first six books in their entirety as the last book combines characters and plotlines from both series into an epic finish!! So if that's the sort of thing you enjoy to read, you can give The Moon Dwellers or Fire Country a try. If not, no worries at all! My newest series, Salem's Revenge (first book is Brew), is a YA post-apocalyptic/fantasy trilogy about witches taking over the world. It borders a little on horror, but also has a fair bit of comedy in it as well as a magical dog! So if you like witches and post-apocalyptic books, you might enjoy this one too :) If not, I completely understand. 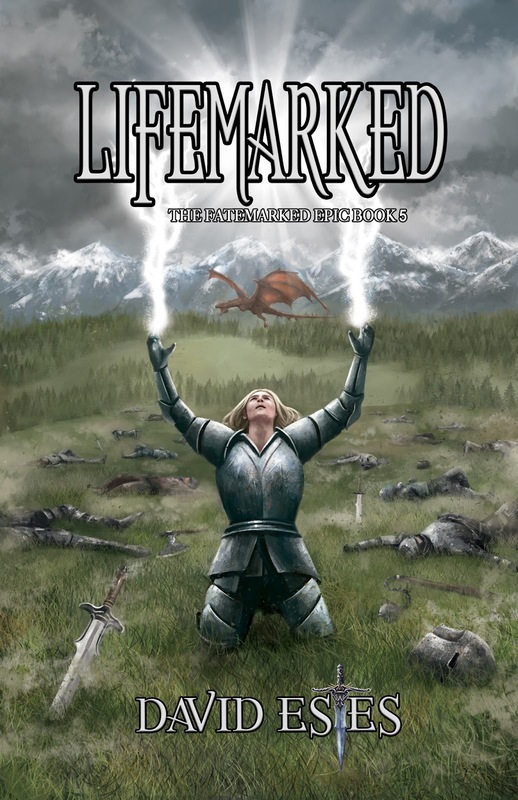 At long last, Lifemarked, the 5th and final book in The Fatemarked Epic, is LIVE on Amazon.
" Karen’s Library wrote: "David wrote: "Sorry, it's been a while since I checked in but I've been plodding along, currently at around the halfway point. Karen’s Library wrote: "David wrote: "Sorry, it's been a while since I checked in but I've been plodding along, currently at around the halfway point. I'm really enjoying watching this story develop. Complex characters an..."
Ha! Just read it. Yeah, I had the same reaction. Those things always confuse me which is why I could never write this kind of book. But I like to read them! Glad you liked it KB :) ...more "
"David Estes has begun a new series, The Godstar Chronicles, with a dynamic blockbuster filled with alien races and lots of action. Can't wait for the next book!" We’d love your help. Let us know what’s wrong with this preview of Star-Born Mage by David Estes.
" No problem and thank you! " " Wow, I have not heard of it but it sounds interesting. Thanks for the rec! " 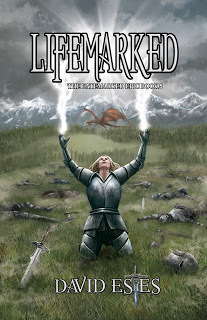 In order to be ready for the release of the 7th and final book in the combined Dwellers/Country Sagas, The Earth Dwellers, you need to have read all 6 books in the two series. How many have you read so far? Zero! I'll be taking advantage of The Moon Dwellers Book Birthday on June 30th to get The Moon Dwellers for free! 1! Time to take a sick day from school/work to read all day in bed! 2! Eep! I need more reading time! 4! I've still got time! I messaged you something on here, didn't want post it on here. Brittany wrote: "Slip was both wondrous and awful to read as a Mother! I can't wait to read the rest of the Trilogy!" Slip was both wondrous and awful to read as a Mother! I can't wait to read the rest of the Trilogy! I'm excited that we are now officially GR friends!!! Thank you! Christine wrote: "I was wondering if you can autograph your book called fire country and send it to me in the mail please"
Hi Christine! Great to hear from you :) Can you please email me at davidestesbooks(at)gmail(dot)com so we can chat about your request? Talk to you soon! Thanks so much, Jenia!! I really appreciate it :) Have a great week! HAPPY BIRTHDAY! Hope your day will be filled with a lot of joy. You are wonderful writer and been amazing friend. Let your day be Magical. HAPPY EASTER TO YOU. Keep on writing! Joey wrote: "David, I must say, the way you wrote The Country Saga and The Dweller books were amazing! I usually do not like to read books that have series where they change characters and story lines but I dec..."
David, I must say, the way you wrote The Country Saga and The Dweller books were amazing! I usually do not like to read books that have series where they change characters and story lines but I decided to give it a try. WOW! I am so glad that I did. The books were just amazing! I cried and laughed and felt everything. Absolutely amazing. Thank you for the opportunity to read such amazing books. Aw you're most welcome, you too!! How are you? Hope you're well! Hi Christine! Thanks so much for your interest in a signed book! Do you already own a paperback of Fire Country that you want me to sign or do you want me to send you a signed copy of Fire Country? If you already have the paperback, I'd be more than happy to have you send it to me and then I can sign it and send it back. You would just have to pay for shipping on both ends. If you don't already have the paperback and want me to send you a signed book, you'll have to wait until I do my next signing, which I'm planning for mid-November. Typically I take orders on signed books for about a week, and then do a bulk order of books which I sign and send to everyone who ordered. Let me know which option you prefer and I look forward to signing your book! No worries, thanks for accepting!! I'm excellent! How are you? Well, I'm excellent except for the two hurricanes heading for where we live in Hawaii lol!! I haven't been on here for ages! How are you? You're most welcome and thank you! Thank you! I managed get some writing in. This sat i am flying out to montana to see family(taking a vacation) should be nice since i never been there. I need a vacation, kids been bit out control lately lol. I can't wait to read your new novel! Good luck with work and conquering the writer's block! Just seeing how you doing. I still work in summer, just less kids but still pretty busy. How's the writing going? I have bit of writer's block but still trying write something. Thanks for the request. I was kinda shocked when I sas that you had written the moon dweller series, the fist book has been sitting on my bookshelf collecting dust for some time now and I can't wait to read it. It's always great to find a really nice author that enjoys being in touch with his readers. How you been? So know book i started while back. Forever Promises. I re wrote it bit and it's now 92 pages. I'm trying not edit it too much, not till i finish it. Or never will. Hope your writing going well. No worries, thanks for accepting and popping by! Hi Daniel, thanks so much for your interest in :) The easiest and least expensive way to get The Moon Dwellers is via ebook on Kindle, Nook, Kobo, iBooks or Smashwords :) Unfortunately, the only way to get the paperback is on Amazon.com which ships from the U.S. The book is not in bookstores, but it has found its way into a number of Canadian libraries, so you might want to check your library's listings online. If your local library doesn't carry my books, you can request that they stock them, as my books are in the catalogue for Canadian libraries. Hope this helps and I really hope you're able to read The Moon Dwellers and the entire Dwellers and Country Sagas! Moon Dwellers has an ingriguing premise, and I would like to give it a go, but I don't know where to find it in Canada. Wondering if you knew how I could get my hands on this book without overpaying for shipping from the US.